Interview with David Lesondak: Fascia, Your Body's "Intranet"
David Lesondak, BCSI, KMI, FFT, LMT is a member of the Allied Health Professional Staff in the Department of Family and Community Medicine at UPMC, a board-certified Structural Integrator, visceral manipulator and fascial fitness trainer. In recent years, David has been the official documentarian for the most advanced conferences in fascia research. And in 2014, David lectured on the role of fascia in the mind/body connection at the bi-annual Fascia conference at Ulm University, Germany. Thanks for sharing this! It really helps open some new terrain! Love this interview! Lesondak speaks as he writes and vice versa – lots of fun and power-packed information! Whether training for performance or health and well-being, we must be oh so willing to learn and relearn. Our bodies are a landscape of changing science. What a privilege to be along for the ride! 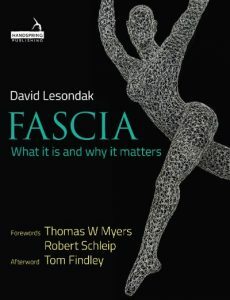 Lesondak helps us to explore the often new world of fascia and have a good time while we’re at it. Well done, Josh, in leading him through this interview. Thanks Josh and David. What an engrossing subject matter, and David is wonderfully entertaining in his explanations. So much great info, and makes me realize again how everything in the body is linked together. Will be buying the book for sure. Enjoyed this so very much! Very entertaining and informative! Thank you both! I cant wait to get the book!